At CNDLS, we believe digital technology can play a meaningful and powerful role in achieving learning goals. 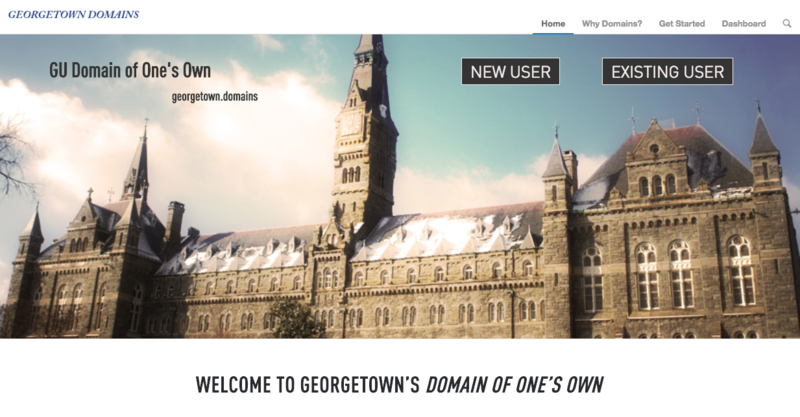 In 2015, we partnered with Georgetown University Information Services (UIS) and Reclaim Hosting to bring Georgetown Domains to campus, an effort to give Georgetown students, faculty, and staff the opportunity to claim a web hosting environment and personal domain free of cost. GU Domains is part of the larger Domain of One’s Own effort on campuses nationwide aimed at helping students understand, develop, and curate digital identities through their own website. To date, GU Domains has over 650 active users, with 60% student users and the remainder faculty and staff representing 54 different departments. In June 2017, a group of CNDLS staff members attended the 2017 Domains conference in Oklahoma City and presented their exciting vision for a Domains Community Site—a community space where users can create, collaborate, and discover with each other in an online environment. The presenters, who included CNDLS’ Yianna Vovides and Marie Selvanadin and Jim Groom (University of Mary Washington) and Tom Woodward (Virginia Commonwealth University), shared a three-layer model to support engagement with Domains at the campus, programmatic, and individual levels. We invite you to learn more about the model and the project by reading this detailed post we wrote this past summer. More recently, Vovides and Selvanadin have continued work on Community Sites with Groom and others, and their work was featured in a blog post authored by Groom. 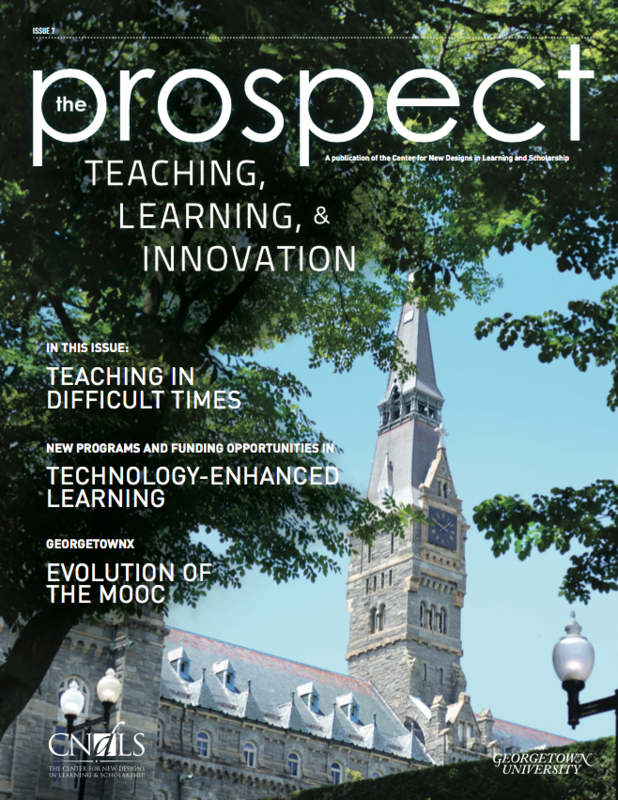 In it, he discusses the process of conceptualizing Georgetown University Domain’s Community Directory site and the process of working with CNDLS staff members to create it from scratch. To read more about the research and technical steps of this project, read Groom’s full blog post here. We’re deeply grateful for our partnership with Groom and others, and are excited about the future of Domain’s Community Directory. For questions or additional information, please reach out to Yianna Vovides, yv11@georgetown.edu. At CNDLS, we believe digital technology can play a meaningful and powerful role in achieving learning goals. In 2015, we partnered with Georgetown University Information Services (UIS) and Reclaim Hosting to bring Georgetown Domains to campus, an effort to give Georgetown students, faculty, and staff the opportunity to claim a web hosting environment and personal domain free of cost. GU Domains is part of the larger Domain of One’s Own effort on campuses nationwide aimed at helping students understand, develop, and curate digital identities through their own website. To date, GU Domains has over 650 active users, with 60% student users and the remainder faculty and staff representing 54 different departments. In June 2017, a group of CNDLS staff members attended the 2017 Domains conference in Oklahoma City and presented their exciting vision for a Domains Community Site—a community space where users can create, collaborate, and discover with each other in an online environment. The presenters, who included CNDLS’ Yianna Vovides and Marie Selvanadin and Jim Groom (University of Mary Washington) and Tom Woodward (Virginia Commonwealth University), shared a three-layer model to support engagement with Domains at the campus, programmatic, and individual levels. We invite you to learn more about the model and the project by reading this detailed post we wrote this past summer. More recently, Vovides and Selvanadin have continued work on Community Sites with Groom and others, and their work was featured in a blog post authored by Groom. In it, he discusses the process of conceptualizing Georgetown University Domain’s Community Directory site and the process of working with CNDLS staff members to create it from scratch. To read more about the research and technical steps of this project, read Groom’s full blog post here. We’re deeply grateful for our partnership with Groom and others, and are excited about the future of Domain’s Community Directory. For questions or additional information, please reach out to Yianna Vovides, yv11@georgetown.edu. Posted December 5, 2017 by Katherine Grygo & filed under Domains.